Directions: From Stayton, Oregon head south on N 1st Ave. Just after leaving town this becomes Stayton Scio Road. At 1.5 miles turn left onto Cole School Road. After 3 1/4 miles, turn right on Ridge Road and follow it down the hill. At the bottom of the hill the road becomes Richardson Gap Road. You will pass through the Shimanek Covered Bridge. At 6 1/4 miles turn left on to Fish Hatchery Drive. 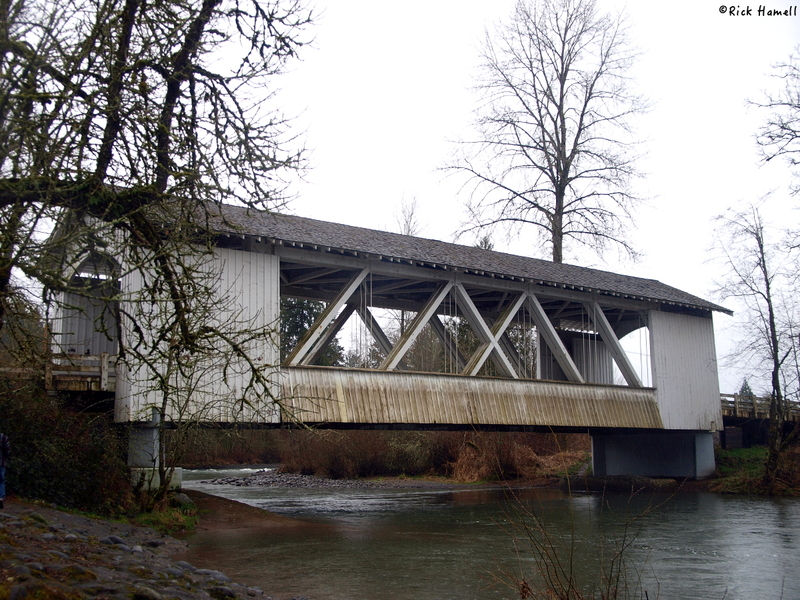 The Larwood Covered Bridge will be directly ahead after 3 miles with the Larwood wayside is on the left. There is not a lot of information about Larwood. William T. Larwood settled between Roaring River and Crabtree Creek in 1888. By 1893 the town was large enough to need a post office, it was opened on July 25th of that year. Larwood was the postmaster. It’s reported that two covered bridges were here, “feet apart,” one crossing Roaring River and one crossing Crabtree Creek. 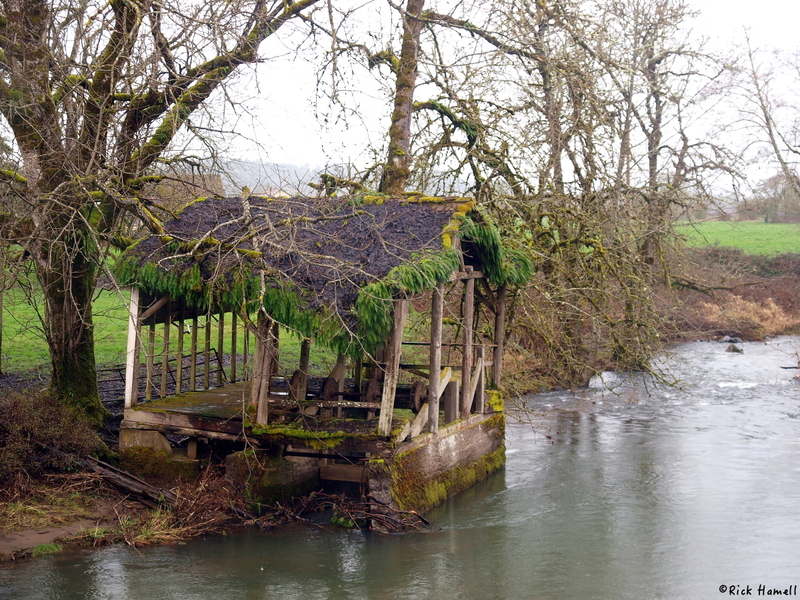 Larwood, Oregon had a blacksmith shop, a general store, and in 1900, a water-powered mill. Unfortunately the town didn’t grow fast enough, and the post office was closed to nearby Crabtree on August 31, 1903. It’s unclear why or when the two covered bridges were removed, but the current bridge was built in 1939 and crosses both the river and creek at this point. The water powered mill was repaired and restored in 1978, but it’s since been heavily damaged again. Other then the current bridge, the road name, and the remains of the mill, there is no trace of Larwood. Nothing known. Please comment below if you know anything! The old water mill is now collapsed as of July 15, 2015.